Dr. Marc Otto, originally from Arizona, moved to Denver in the summer of 2013. He received a Bachelor of Science from Arizona State University and his Doctor of Optometry degree from the Pennsylvania College of Optometry at Salus University in Philadelphia, Pennsylvania. During his externships in California, Colorado, Illinois and Pennsylvania, he gained experience in ocular disease management, binocular vision disorders and primary care. 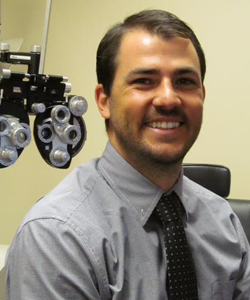 Dr. Otto is licensed in full-scope practice including: family eye care, pediatrics, geriatrics, contact lenses and corneal refractive therapy co-management. He is a member of The American Optometric Association, The Colorado Optometric Association and The American Academy of Optometry.